ARLINGTON, Va., U.S. – Nescafé, inspired by the coffeehouse experience, is reimagining ready-to-drink beverages with its Nescafé Coffee Protein Smoothie and Nescafé Cold Whipped Latte. These two coffee products, available now in the U.S., shake up the coffee routine and offer uniquely delicious flavors. Nescafé Coffee Protein Smoothie helps you get more out of your mornings with a plant-based, non-dairy beverage, while Nescafé Cold Whipped Latte provides a true barista-inspired, frothy latte texture for a perfectly indulgent reward. These innovative ready-to-drink beverages give coffee fans elevated yet convenient ways to enjoy coffee, whether they are tackling the morning commute or looking for an afternoon pick-me-up. 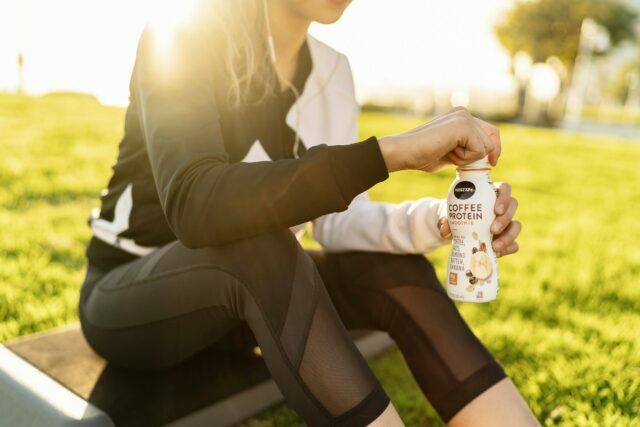 Nescafé Coffee Protein Smoothie is a delicious plant-based coffee protein smoothie made with 100% Colombian Arabica coffee, oats and almond butter. With 15g of protein, each 11 oz. single-serve bottle contains as much as one cup of coffee and is available in Banana or Mocha flavors for a suggested retail price of $3.49. Nescafé Cold Whipped Latte is unlike other ready-to-drink coffee products on the market. Just shake to unlock layers of true froth and foam to deliver latte texture you expect from a coffee-shop experience. This deliciously chilled blend of indulgent flavors comes in single-serve 10 oz. bottles and is available in Coffee or French Vanilla flavors for a suggested retail price of $2.49. Both new Nescafé ready-to-drink coffee products are now available at retailers nationwide in the U.S.